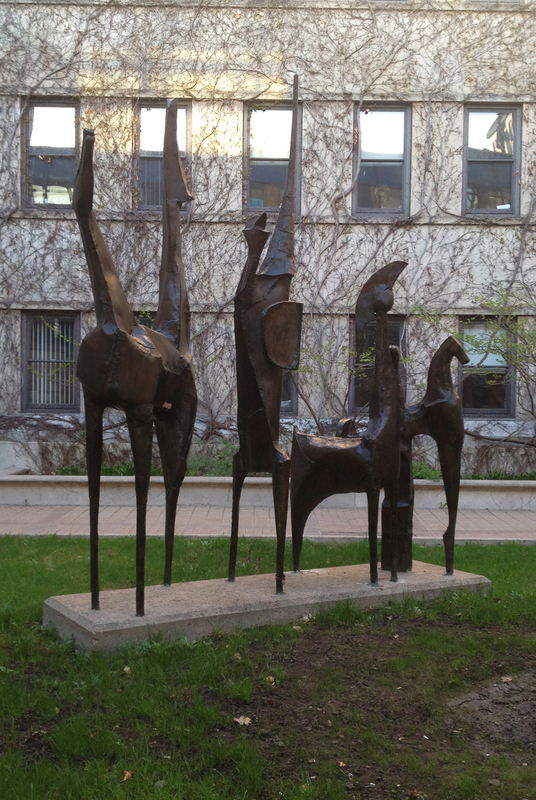 After posting my first bike tour of Bruce Garner’s sculptures in and around downtown Ottawa, his wife Tamaya got in touch and generously forwarded me locations of a number of other pieces throughout Ottawa I didn’t know of, or didn’t realise were his creations. Pleased as punch, I subsequently put together this second tour. First stop – Children of the Wind, tucked off of Wellington across the street from the Library and Archives Canada building. The next two are in Lowertown. To get there I rode along the Voyageur Pathway on the Quebec side. Phoenix is located on the lawn of a private home at 152 St Patrick St.
Succor is located a few blocks north at the entrance to the Elizabeth Bruyère Centre. 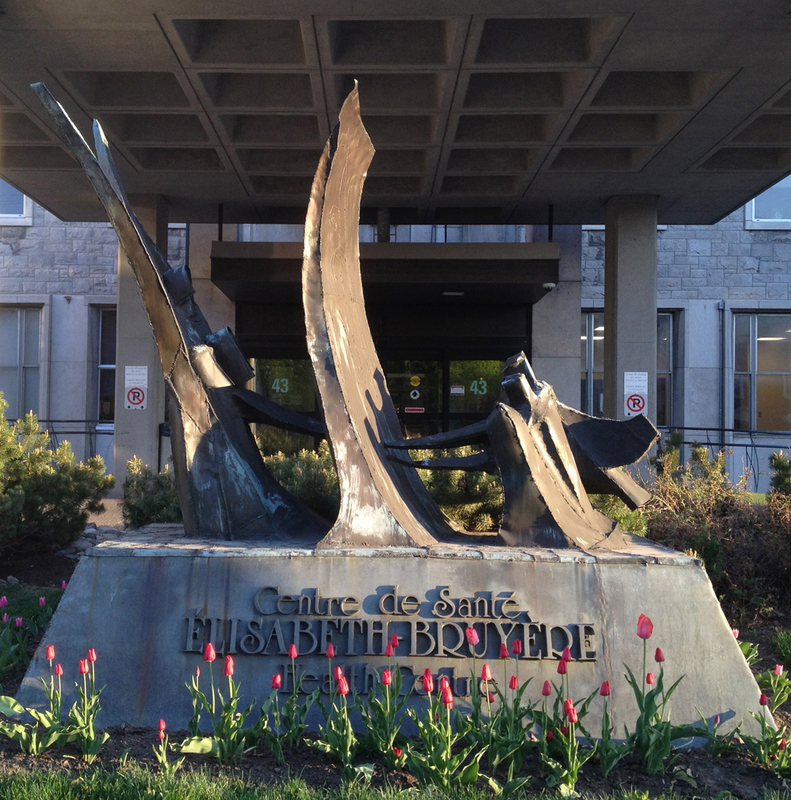 Next stop – Ulysses, in the courtyard of the University of Ottawa Arts building. A majestic grouping of figures in a wonderful setting. This has become my favorite of Bruce’s sculptures. 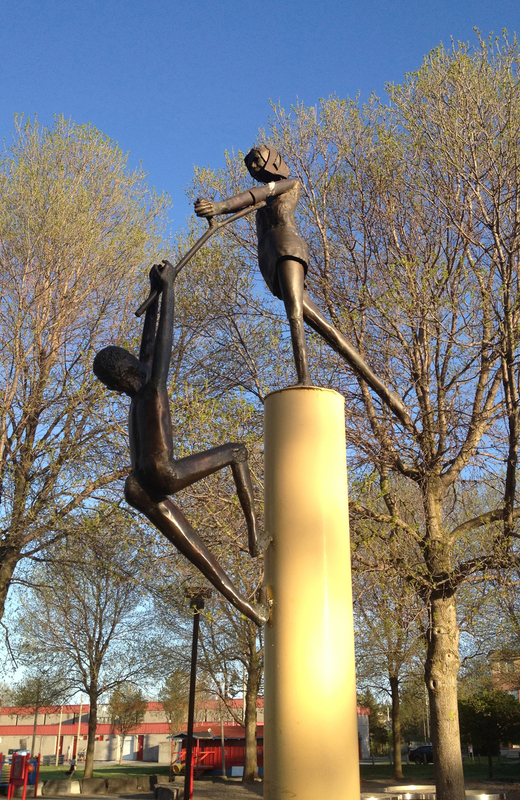 The final sculpture on the tour is Play Pals, located in Brewer Park. There is also a sculpture Tamaya mentioned located downtown in the World Exchange Plaza, titled Moon Fragments, which I did not include on the tour as it is indoors, however I have marked its location on the map below, along with all of Bruce’s sculptures from tours 1 and 2, for those who may wish to plot a bike or walking tour of their own. UPDATE – July 2018: While biking through Barrhaven I discovered this work by Bruce, located on the south-west corner of Malvern Drive and Greenbank Road. I’ve added it to the map below. Thank you so very much for one of the kindest acts a stranger can do! To have a bike tour of great outdoor sculpture is wonderful. You have given my husband a great gift! 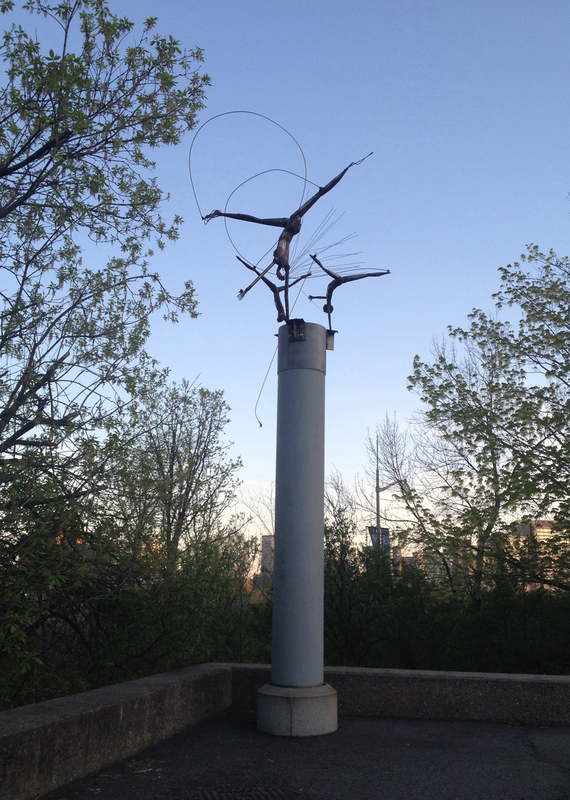 We have a lovely windvane by Bruce on the old Town Hall in Metcalfe (now called a City of Ottawa Client Service Centre. I could send you a photo, if you are collecting sites. Please do send me a photo – that would be great!